This is a comprehensive list of all of the clothing that I, Amy, take on backpacking trips, including the rationale for choosing each item. I care a lot about keeping my pack weight as light as possible but I care even more about being comfortable. I first search for models that meet my comfort and function requirements, and then choose the lightest option. If I find an item that is perfect I monitor several websites and when there is a great sale price, I buy multiples for my reserves. I am very disappointed when a perfect item is no longer available. The total weight of all clothing is 104.7 ounces (6.54 pounds, 2.97 kg). While hiking I always wear shoes, insoles, socks, shorts, shirt, and Tilley hat, so those 51.3 ounces are not included in my base pack weight. The remaining 53.4 ounces is heavier than what ultra-light hikers carry, but is substantially lighter than most novice backpacker’s loads. 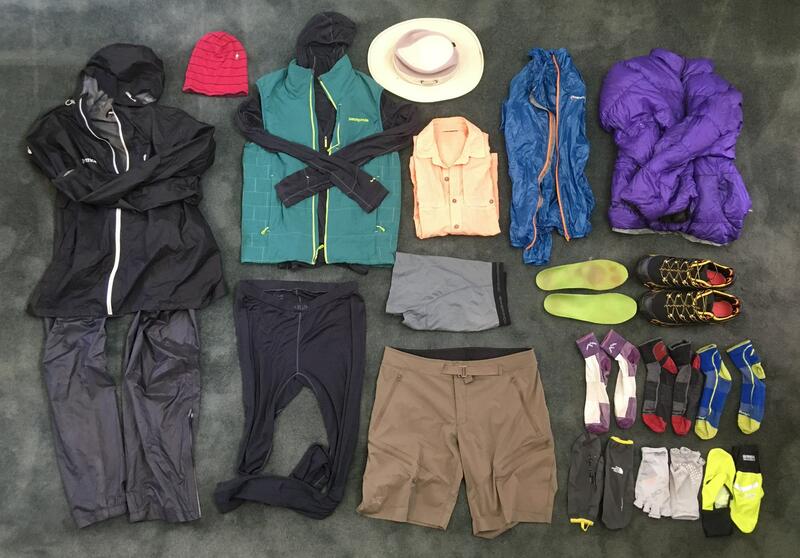 This selection of clothing has served me well for thousands of miles in a wide variety of 3-season conditions. Many of the links are affiliate links, meaning that we will receive 4-8% of the sale price at no cost to you. We donate all revenue to land conservation groups. Read our Code of Ethics. Shoes: La Sportiva Ultra Raptor (not GTX model) 25.2 What matters to me: trail-running shoe; durable enough to last 600-800 miles; not waterproof; blister-free fit; tongue is fully attached to the body so dirt and seeds can't come through the gap; quick-drying. My beloved model, the Montrail AT+, is no longer made, and I am now using the La Sportiva Ultra Raptor. It has the grippiest sole I have ever used and I love that aspect. I walked 630 miles Across Utah with no blisters or sore feet, and they held up very well for that distance. In a second pair I hiked a similar distance through the Italian Alps with no sign of wearing out. Wool Hoody: RAB Merino+ Hoody 7.6 About five years ago I switched from carrying a wool zip-turtleneck to a wool hoody. I love the hoody. In terms of warmth it has the same effect as a zip-turtleneck plus balaclava, but I don't have to worry about losing the hat. This may sound minor, but losing things is a big problem when on a long trip, and hats are prime candidates for getting misplaced. What matters to me: snug fit in the body and sleeve as that is much warmer than a loose fit; sleeves long enough to extend beyond the wrist, preferably with a thumb loop; hood fits snugly around my face so wind doesn't reach my ears; the neck of the hood is long enough that I can turn my head or look at my toes and the hood isn't displaced; very deep zipper to provide good ventilation; fabric weight in the 160-200 range is ideal, up to 250 is OK.
Hullo! When do you start wearing waterproof boots? Obviously for the winter, but for summer high mountaineering, you still stick to “trainers”? Isn’t it a problem if there is some snow (say, 5cm)? We don’t do any hiking or skiing in winter conditions. That’s a benefit of living in the San Francisco Bay Area, where we have mild conditions year round. I wear trail runners in three season conditions that include occasional snow. Our deepest snow in the past few years was 40-50 cm. It’s not unusual for my shoes to get saturated during river crossings, hiking through wet grass, or hiking in snow. I don’t worry about hiking in wet feet, it’s just not a problem. The advantage of hiking in non-waterproof shoes is that they dry much faster than waterproof shoes. Nearly all long-distance hikers I’ve met have opted for the same choice. That said, James often hikes in light-weight waterproof boots. But his rationale is different; he’s got arthritis in one foot and it is difficult to find any footwear that works for him. He’ll wear any low boot that can accommodate the golf-ball joint in his great toe, be they waterproof or not. Cristina, the clothing list is for me, and I am a woman. At some point we’ll add more articles about other gear, all of which is shared by a male/female couple. Hey! If you need a replacement for that Nunatak down sweater, or other insulated backcountry gear, I would like to extend a discount in exchange for the fabulous trip reports. Great adventures! Jan, owner Nunatak. Thanks Jan, that’s a nice offer. You carry three pairs of socks in addition to the ones you wear, but only one extra pair of undies? That’s what the photo looks like. Why so many socks and so few underwear? Socks take longer to dry. Those ExOfficio undies dry really fast. I can rinse and dry them while stopped for lunch. And I sleep in my long johns rather than undies, so they count as a second pair of undies. I should clarify that my kit is 3 pairs of socks and one pair boxers total. When I rinse my boxers I’m either in long johns or shorts, but no undies. And while I’m at it, I’ll admit I wear men’s 9″ boxers because they fit better than the women’s model and I like the length. Go figure. Thanks! I love your website!